The 416 Fire burns in the background on the south side of the Hermosa Creek drainage past the Hermosa Creek Campgrounds on June 9. After the fire started, the San Juan National Forest enacted Stage 3 restrictions and closed the San Juan National Forest. Most of the forest reopened Thursday. Most of the San Juan National Forest reopened Thursday after being closed because of Stage 3 fire restrictions. 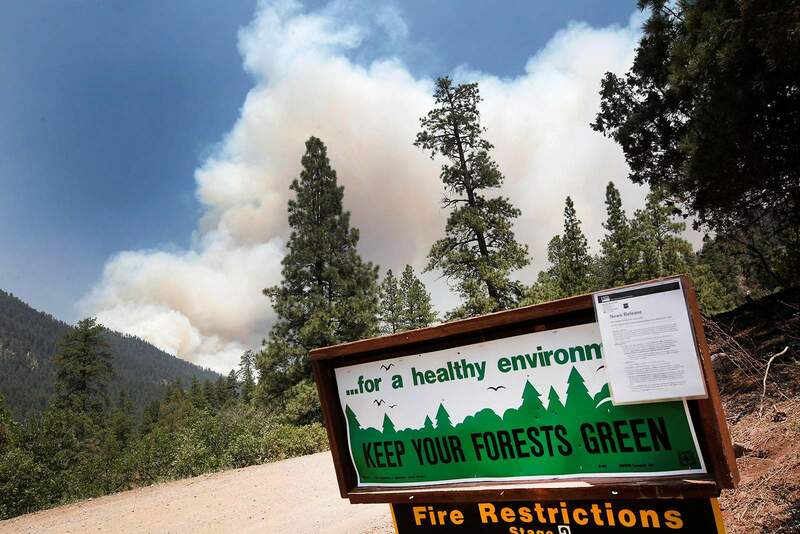 Nearly all previously closed public lands around Durango, including the entire San Juan National Forest, reopened Thursday, despite ongoing extreme drought conditions and unprecedented fire danger. Last week, these areas were closed to recreation in an effort to prevent the outbreak of wildfire while two active fires – the 416 and Burro – swept through the San Juan National Forest north of Durango and northeast of Dolores, respectively. But the U.S. Forest Service said Wednesday that rain over the weekend tempered fire behavior, and that long-range forecasts are predicting the region will not have the same hot, dry and low-humidity conditions that dominated the first part of June and led to extreme fire activity. Southwest Colorado – amid one of the driest years in recorded history – received between 0.5 and 1.5 inches of rain last weekend, which helped slow the 416 and Burro fires, but not extinguish them. If another fire ignites, said Richard Bustamante, fire manager for the San Juan National Forest, resources are available locally to respond quickly. But the Forest Service’s explanation of why it, in part, lifted Stage 3 restrictions contradicts what weather experts are predicting. Jeff Colton, an incident meteorologist for the 416 Fire, said any benefit the rain brought will be gone by this weekend. The region is quickly returning to the same hot and dry weather conditions that existed before last weekend’s storm, and thus the perfect recipe for fire danger, he said. “From where we were with the rainfall, the atmosphere has dried up dramatically,” Colton said. In the long term, the National Weather Service is forecasting normal to below-normal rainfall for Southwest Colorado over the next two weeks during a month that is typically the driest of the year for region. The National Weather Service also predicts above-average temperatures for the next two weeks. 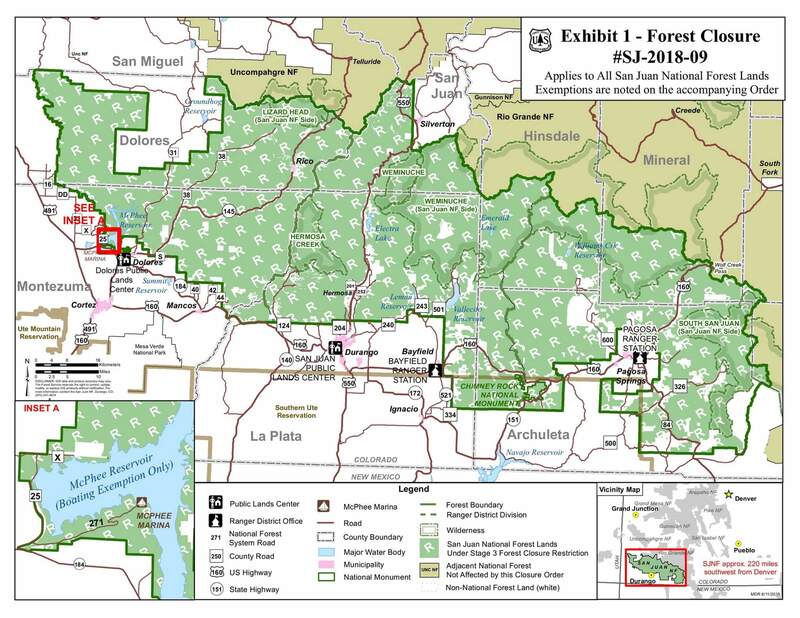 Bustamante with the Forest Service said other factors, such as the impacts to local economies, played a part in the decision to reopen the forest. Local businesses in Durango and Silverton have been feeling the economic effects of the 416 Fire and the closure of the San Juan National Forest. Anne Rapp, owner of Rapp Corral, said her outfitting company – which operates mostly on forest land – has already lost more than $30,000 in cancellations for horseback trail rides. A lot of the financial hits because of the 416 Fire have yet to be felt. Rapp said she has heard people have chosen other places for vacation and have canceled plans to visit the area in July. So it was at least a sliver of good news when Rapp heard Wednesday that the San Juan National Forest would reopen Thursday, albeit with a sense of caution. DeAnne Gallegos, director of the Silverton Area Chamber of Commerce, said the town was surprised by the Forest Service’s decision to reopen. The town of Silverton has been hit especially hard, with on-and-off closures of U.S. Highway 550 and the suspended service of the Durango & Silverton Narrow Gauge Railroad, which delivers tens of thousands of visitors throughout the summer. But just as important are the popular Colorado, Ice Lakes and Highland Mary trails on Forest Service land. “To have those backcountry hiking trail accessible to our visitors is essential to our outdoor economy,” Gallegos said. Stage 2 fire restrictions, which will remain in place until further notice, prohibit open flames, smoking, fireworks and other activities that can cause wildfire. The San Juan National Forest, Bureau of Land Management and city of Durango public lands also reopened at 3 p.m. Thursday. Fort Lewis College also reopened its open spaces and trails on campus, which includes the Nature Trail, Sky Steps, Rim Trail and the disc golf course. Lake Nighthorse, which is managed by the city of Durango, will reopen at 7 a.m. Friday. An area around the active 416 and Burro fires will remain closed to public entry, including segments of the Colorado Trail from Molas Pass to the Junction Creek terminus. Building, maintaining, attending or using an open flame, including fire, campfire, stove fire, charcoal grills and barbecues, coal- and wood-burning stoves, and devices (stoves, grills or lanterns) using liquid fuel such as white gas or kerosene. This prohibition applies to the entire San Juan National Forest, including wilderness and developed camping and picnic grounds.Except: Devices (stoves, grills or lanterns) using pressurized gas canisters (isobutene or propane) that include shut-off valves, or within an enclosed vehicle, trailer, or building. Smoking, except within an enclosed vehicle, trailer or building.Welding or operating acetylene or other torch with open flame.Operating or using any internal combustion engine (e.g. chain saw, generator, ATV) without a spark-arresting device properly installed, maintained and in working order meeting USDA Forest Service or SAE approval.Operating a chain saw without an approved spark-arresting device, a chemical pressurized fire extinguisher (8 oz. capacity by weight or larger and kept with the operator) and a round-point shovel with an overall length of at least 35 inches readily available for use, or outside of the “Hoot Owl” restricted hours of 5 a.m. to 1 p.m.Using an explosive. This includes but is not limited to fuses or blasting caps, fireworks, rockets, exploding targets and tracers or incendiary ammunition.Discharging a firearm, air rifle or gas gun.Possessing or using a motor vehicle off established roads, motorized trails or established parking areas, except when parking in an area devoid of vegetation within 10 feet of the vehicle. Do you support reopening the San Juan National Forest after a weekend of rain, despite recent extreme fire danger?